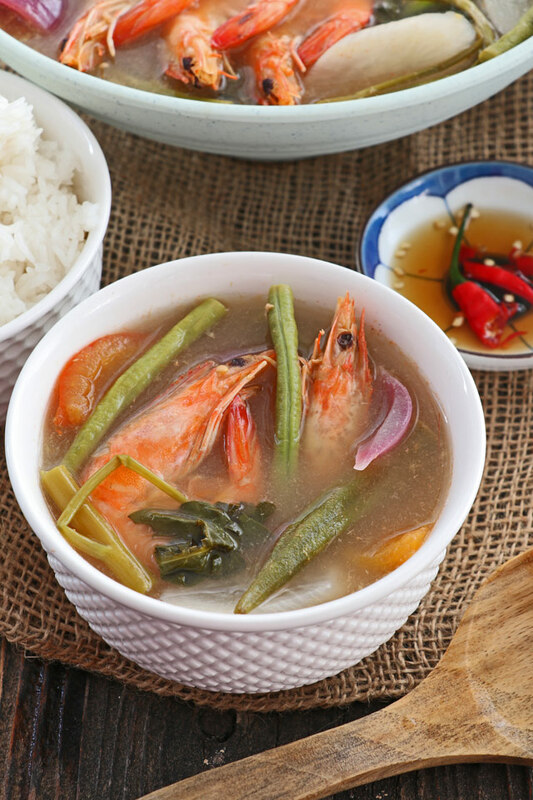 Learn how to cook Sinigang na Hipon with this quick and easy recipe. 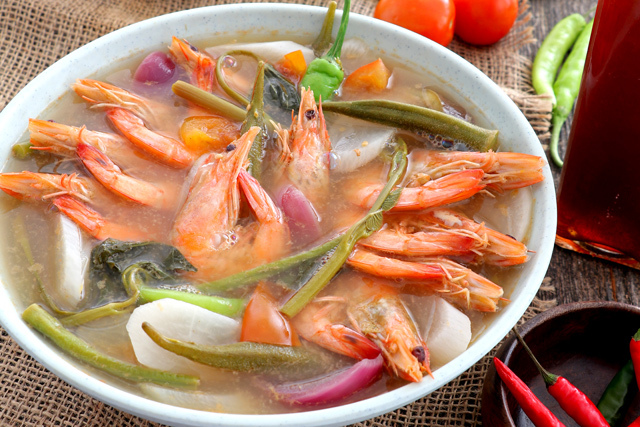 A variation of the beloved Filipino sour soup dish that is cooked with shrimp with tamarind as a souring agent. 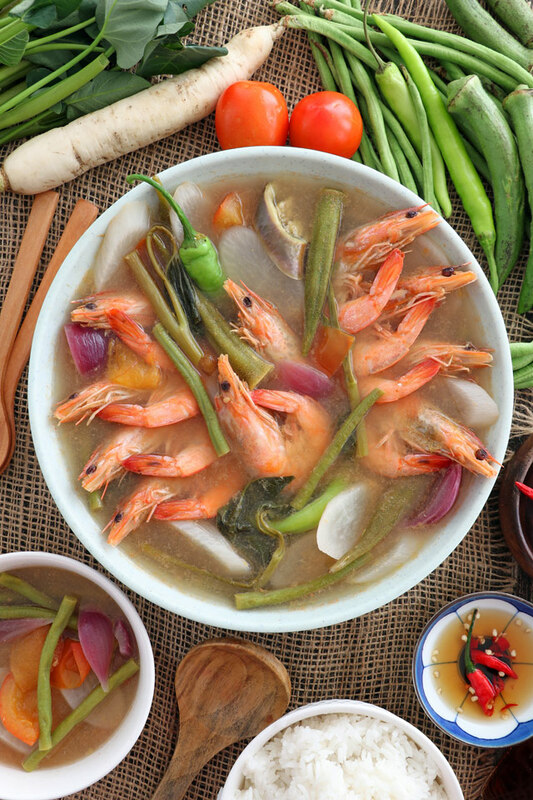 Sinigang is one of the most popular and favorite Filipino dishes among locals. It is right there with Adobo although maybe not (yet) quite as popular internationally. The normal response I’ve seen when it is served to foreigners is either they like it instantly or not at all. Well not everyone has the affinity to sour food as Filipinos do. The way we enjoy eating green mangoes, young tamarind, and kamias like we are eating treats. Yes, only in the Philippines. Armin, himself, is not much of a fan of Sinigang when he first tried it. Unlike the two Japanese guys who visited our office when I was still working for my old company. They had it on their first visit and were asking for it when they came back. 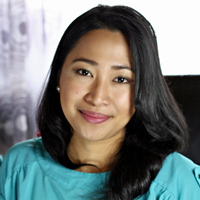 Sinigang is simply the way of cooking meat in a stew or soup with a unique savory and sour taste. 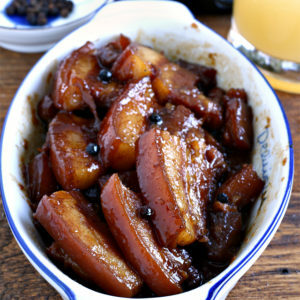 Different kinds of fruits that are bountiful in the Philippines are used to sour the soup. 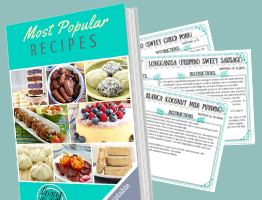 Tamarind is the most popular choice for most sinigang recipes. Green mango, santol (lolly fruit), calamansi, guava are some other examples. Aside from the meat and souring agent, vegetables are also added. As I mentioned above, Sinigang na Hipon is just one of the many variations of Sinigang. It is called a different name depending on the souring agent and the meat that you are using. We also have a version where miso is added and it is usually made with fish as meat. 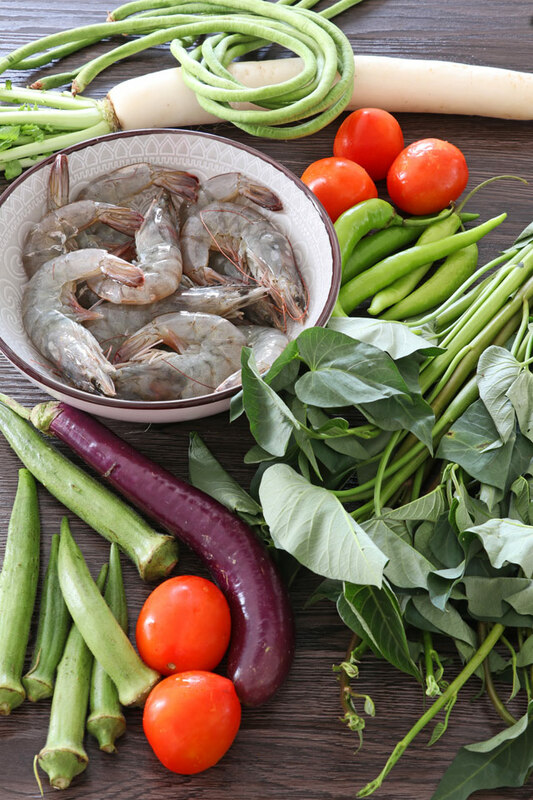 To cook Sinigang na Hipon, it is easier to prepare all the ingredients first. You would not want to overcook your vegetables as the cooking process itself is very straight-forward and done in just a few minutes. Initially, ripe tomatoes and onions are boiled in water. Followed by the radish and then the shrimp. If using tamarind mix, it may be added as soon as the shrimp are cooked. Vegetables come to the pot next, in the order depending on how long they need to cook. Green chili is usually added but if you are not into spicy soups, you can skip this. The shrimp go into the pot unpeeled and with heads still intact. Believe it or not, this is the only way to go if you want a soup that is full of flavor. Fish sauce is the choice of seasoning as it adds umami taste and further enhances the shrimp flavor in the soup. Traditionally, Sinigang is cooked using unripe tamarind. But nowadays, it is made easier with the availability of the tamarind mix. They are usually available in Asian/Filipino food stores or even online. This dish not only tasty, but it is also really healthy as it also has plenty of vegetables in it. You can add daikon radish, okra, eggplant, water spinach, long-yard, taro beans and banana heart No need to complete the list, with even just one or two of them, you can already enjoy this hearty viand. 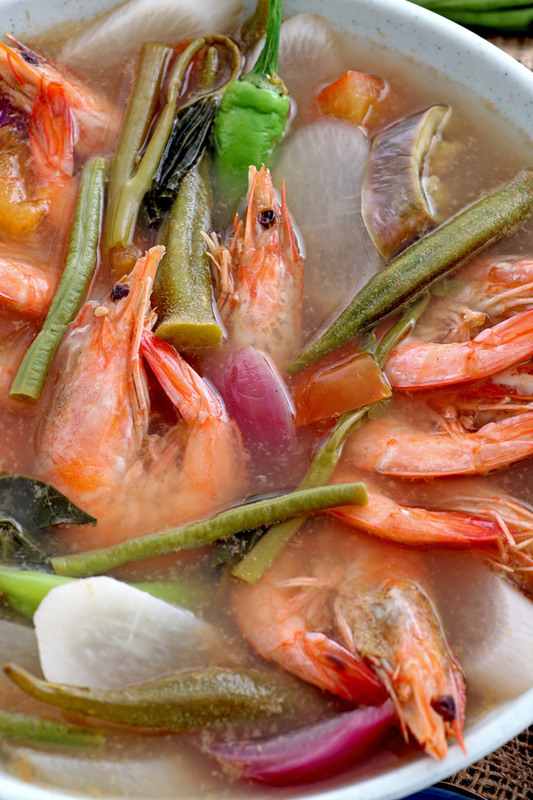 Pucker up and enjoy this Sinigang na Hipon, a Filipino sour soup with shrimp and vegetables using tamarind as the souring agent. Bring 1 liter of water in a pot to a boil over medium-high heat. Add the tomatoes and onions. Cook for 2 minutes. Add the radish and cook for another 2 minutes. Add the shrimp. Once the shrimp turn pink, add the tamarind mix. Simmer for about 2 minutes. Add the beans followed by the okra, and chili. Bring back to boil and cook for 2 minutes. Season with fish sauce and add the eggplant. Cook for a minute and, lastly, add the water spinach. Push the leaves down gently until submerged. Simmer for another minute. Transfer to serving bowls and serve while hot with rice.